The French sculptor Alain Vuillemet was born in Paris in 1947. He is the worthy heir of the Gaulish long-standing tradition of metalwork and love of high-quality craftsmanship, in the respect of noble material: brass, stainless steel, Corten steel in an intimate relationship with natural elements. The modern sculptor Alain Vuillemet began with learning the ancient skill of charcutier. And one day, fate brought him to meet Marcel Escoffier, an accomplished and renowned by his trade peers, costume designer. Who made him realize that his future was to be a sculptor. Alain worked for a while in publicity, while learning his art trades. With passion, he worked tirelessly to the point of becoming a true expert in metal molding. So recognized as such, that he’ll later be asked to teach. He also creates sonorous sculptures for special events. As any self-respecting sculpting artist, Alain Vuillemet has been given a strong personality. His vitality makes him navigate between a vibrant party life, a steadfastly anarchic spirit and a perpetual quest to sublimate his art craft. In 1990, his life is suddenly rocked into the torment of flames, burning his workshop down, and losing numerous works of art. Maybe a sign of needing to realign himself? Alain leaves Paris for the region of Yonne, in the protective shadow of a castle. He then, works most particularly with stainless steel, material needing strong technical and artistic skills for monumental art pieces. Still rebellious, anarchical and provocative, he then develops monumental art for special events. Performances naturally fascinate him. In 1994, he confined himself into an open cube of smoky Altuglas of 5 meters long. During the next 10 days, he created a new masterly work, under the surprised gaze of people passing by. The carte blanche at the Arrivage finished July 16th, 2016. Alain Vuillemet in front of relief – an homage to Zoltan Kémeny Space in Order. Alain Vuillemet’s creativity thrives with metal, the abstract sculpture is his emotional outlet. His masters are Zoltan Kemeny, César, John Chamberlain, Pol Bury, Etienne Hadju and Eduardo Chilida. 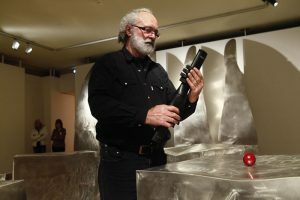 Stainless steel becomes the chosen matter of this metallic sculptures of this artist. Whether they are contemporary monumental sculptures or trophy. He masters techniques that enables him to ply, hammer, flame cutting and welding, transforming metal as he wishes: into tortured or purified shapes, brilliant or matte, reflected or absorbed light, genuine « metallic metamorphosis ». Alain Vuillemet’s sculpting art is not figurative. It is made of upheavals, convulsions, thrusts of life and vibrancy. It jumps and surprises in the image of its creator. Always looking to innovate, Alain Vuillemet embarked in the 80’s in a project called: « Métallophonie », based on sonorous sculptures, using the vibrating property of his metallic artworks. 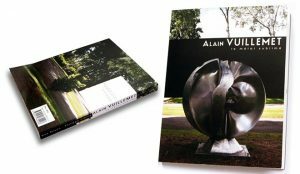 The metal sculptor, Alain Vuillemet, adapts his art in numerous formats, from the monumental steel sculpture to the contemporary garden sculpture, he’s always ready for great challenges in monumental art, creating totems, series of sculptures or performances, becoming himself part of the art work. But he also knows how to mix his art with reality, creating everyday objects like steel tables, stainless steel doors, brass candlesticks, metallic music stands or copper lamps. His creations are unique or in limited editions. He is also a partner to mark an occasion: his one-of-a-kind sculpted trophies, are genuine prizes. This past publicist does not forget that special occasions can’t take place, without unique works of art as mementos, commemorative stelae or monumental steel sculptures created to commemorate a festivity. Nonetheless, faithful to himself, he realizes them in his own way, with vitality, sounds and lights.